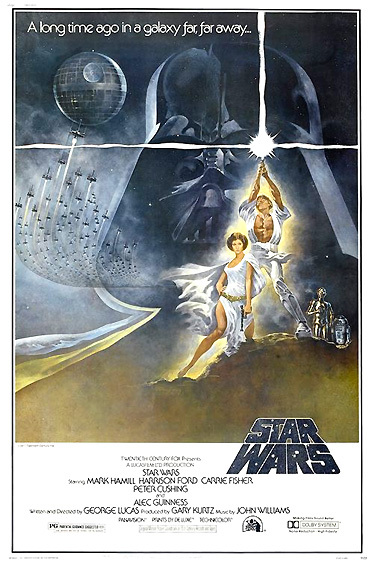 Star Wars (1977), (aka Star Wars, Episode IV: A New Hope) is one of the most popular, profitable, entertaining, and successful science fiction/action - adventure/fantasy films of all time. The film, shot mostly on location in Tunisia, Guatemala and Death Valley (California), advanced special-effects technology to a degree unseen before, with computerized and digitally-timed special effects. It ultimately helped to resurrect the financial viability of the science-fiction genre, a category of films that was considered frivolous and unprofitable, and brought the phrase "May the Force be with you" into common usage. Pre-Star Wars director, USC graduate, and writer George Lucas had begun his career as director of the science-fiction film THX 1138 (1971), an expanded version of a prize-winning feature film he made while studying film at USC. It was produced by American Zoetrope and executive-produced by Francis Ford Coppola. He went on to direct and co-write the immensely popular American Graffiti (1973), a nostalgic story about California teenagers in the early 60s. It took four years for Lucas to develop his next film - this astounding cult film about "A long time ago in a galaxy far, far away..." from 20th Century Fox. The modestly-budgeted production (of about $11 million) from the TCF/LucasFilm production company, made in Britain, was based upon Lucas' recollections of Saturday afternoon matinees, serials, and comic strips, usually with cliff-hanging endings. The mythological tale of space-age heroism (fighting Evil for the sake of Good) featured memorable characters - a benevolent ex-Jedi Knight (Guinness), an imprisoned Princess Leia (Fisher) of the peace-loving Rebel Alliance, two comical robotic droids (R2D2, named after a piece of film editor's jargon - Reel 2 Dialog 2, and C3PO), a smuggler/mercenary space-pilot (Ford), a beastly creature named Chewbacca (a Wookiee), and an idealistic young boy (Hamill) who becomes trained in the righteous ways of the Force in order to rescue the captured Princess from the evil Empire's Death Star and the dark forces of the Empire, led by evil Darth Vader (voice of James Earl Jones/David Prowse). The impact of the first film in the series was enormous - tremendous profits helped to generate funding for Lucas' state-of-the-art special effects factory known as Industrial Light and Magic (built in Marin County north of San Francisco), and merchandising associated with the film encouraged an entire marketing industry of Star Wars-related items (i.e., toys, video games, novelty items at fast food restaurants, etc.). In a revolutionary approach to Hollywood film-making and merchandising, Lucas had wisely accepted only $175,000 as his writer's/director's fee in return for the much more lucrative forty percent of merchandising rights for his Star Wars Corporation. The 20th Century Fox film set box-office records and was a critical success. However, this appealing film was criticized for encouraging a boom in spectacular (but sometimes drab) special-effects laden blockbusters (with thin plot lines) for decades after. It soon became the most commercially-successful film ever made (and held the record for many years). Prophetically, a few years later, the Soviet Union became the 'Evil Empire' during the Presidency of Ronald Reagan, and Reagan proposed a strategic space-defense program (or SDI - Strategic Defense Initiative), dubbed "Star Wars" in November 1985 by the media. Although Lucas went to court to protect his title, he lost the case. It was nominated for ten Academy Awards, and won in six (mostly technical) categories: Best Art Direction/Set Decoration, Best Sound, Best Original Score (John Williams), Best Film Editing, Best Costume Design, and Best Visual Effects. Its other four nominations were for Best Picture, Best Supporting Actor (Alec Guinness), Best Director, and Best Screenplay Written Directly for the Screen. The film was also awarded with a Special Achievement Award for Sound Effects for the creation of the alien, creature, and robot voices (Benjamin Burtt, Jr.). It was the first feature film to be screened in Dolby Stereo. The Rebel Alliance has attacked the tyrannical evil Galactic Empire, daringly stealing secret plans to the Empire's new battle station, the Death Star. In the opening view, the small Rebel ship belonging to Princess Leia, who possesses the secret plans, is chased across the screen by a large, wedge-shaped Imperial Star Destroyer cruiser of the evil Galactic Empire. Turbolasers strike the Rebel ship's shields and cause its passengers to be buffeted around in a corridor, including two robot droids, a tiny, round barrel-shaped, whistling and bleeping computer robot named R2-D2 (Artoo Detoo) (Kenny Baker), and its robotic pal, the constantly talking, tall gold-plated C-3PO (See Threepio) (Anthony Daniels). [C-3PO is clearly modeled after the female robot in Lang's Metropolis (1927).] Armed soldiers run down the hallway. Nervous as explosions rock the ship, C-3PO is pessimistic about their escape from the Imperialistic Forces, because their main reactor has been shut down: "We're doomed. There'll be no escape for the Princess this time." R2-D2 whistles and bleeps a response. Their ship is sucked into the underbelly of the huge, armored space vehicle by a tractor beam. Rebel soldiers take their positions at the end of the corridor, preparing to defend the door from an assault. The crippled transport Rebel ship is boarded by an advance guard of white, ceramic-like, space-armored stormtroopers, the Emperor's elite soldiers. A fierce laser-gun battle is fought in the hallway, quickly lost by the Rebel defenders as more and more Imperials charge into the smoking corridor. When control is secured, the leader of the cruel and villainous forces appears - black-garbed, helmeted and faceless Dark Lord of the Sith, Darth Vader (David Prowse, with a deep, breathy voice supplied by James Earl Jones). The two robots escape the crossfire by running across the hallway. Fighting back against the Evil Empire is slim, white-robed Princess Leia Organa (Carrie Fisher), the leader of galactic Rebel Alliance forces. C-3PO hides from the invading troopers and loses sight of R2-D2. Turning a corner, the golden droid notices a young woman dressed in white - Princess Leia - transmitting the blueprints or plans for the Death Star battleship along with an S.O.S. plea, into the data system face plate of her computer robot R2-D2. When R2-D2 is located, C-3PO worries that they will be sent to "the spice mines of Kessel or smashed into who-knows-what!" After a valiant and brave fight, the Rebel ship is brought under Imperial control. On the bridge of the captured ship, Darth Vader confronts the Rebel officers, searching for the intercepted transmissions of the Death Star's plans, but he fails to find them in the transport ship's main computer system. He ruthlessly holds one of the unresponsive Rebel officers by the throat and lifts him with one hand, crushing his throat with an iron grip and tossing him to the side. Vader orders his troops to find the plans and bring him the passengers: "I want them alive." Soon after, the Princess is confronted and refuses to surrender. She fires her blaster at the stormtroopers, but is apprehended and taken captive prisoner by Vader's forces. R2-D2 insists that the two robots enter a restricted area and escape in a lifepod from the ship, bleeping about a "secret mission" and "plans." Threepio refuses to join his droid pal in the cramped spaceship pod, worrying about deactivation for disobedience until an explosion changes his mind. Regretting his decision to follow R2-D2 into the escape module, the two are permitted to jettison away from the stricken Imperial cruiser by Imperial navigators because no "life-forms" are scanned aboard. The two robots escape without harm. Princess: I'm a member of the Imperial Senate on a diplomatic mission to Alderaan. Darth Vader: You are part of the Rebel Alliance and a traitor. Take her away! Vader's Assistant: Holding her is dangerous. If word of this gets out, it could generate sympathy for the rebellion in the Senate. Vader: I've traced the Rebel spies to her. Now she is my only link to finding their secret base. Assistant: She'll die before she'll tell you anything. Vader: Leave that to me. Lord Vader orders one of his troops to generate a fake distress signal from the Rebel ship, and then broadcast to the Senate that all the Rebels aboard were killed. Vader is informed that the stolen battle station plans are not aboard the Rebel ship, and that no transmissions were made from the ship. Vader deduces that the plans were hidden somehow by the Princess aboard the jettisoned pod during the battle. He sends a detachment to retrieve the escaped pod and recover the plans: "There'll be no one to stop us this time!" The two robots crash land their lifepod on Tatooine, a backwater, arid, desert-like planet. There, they wander away from the space pod, lost on the planet's rolling sand dune surface. With a comical "Laurel-and-Hardy" type friendship, C-3PO tells his pal, "We seem to be made to suffer. It's our lot in life." Then he mutters: "What a desolate place this is." C-3PO stubbornly decides to split off from his partner after admonishing his pal's beeps: "Don't get technical with me." They go off in different directions, R2-D2 toward a low lying range of rocky mountains in the distance, and C-3PO across miles of hot desert toward the horizon in the opposite direction. C-3PO blames his misfortune and being lost on his partner: "That malfunctioning little twerp. He tricked me into going this way, but he'll do no better." He spies a reflective piece of metal, a transport, and he summons it, believing it will save him. Meanwhile, traversing through the desolate, hilly terrain, R2-D2 is spied upon by pairs of eyes from the inner darkness of a cave. When a minor rock slide is noticed, R2-D2 whimpers with a child-like sound. Then, the robot is stunned by the blue magnetic rays of a gun, fired by some "Jawas," small, short, yellow-eyed, brown-cloaked, gremlin-like scavengers and scrap/junk collectors of the planet. With a groan, R2-D2 topples over onto the ground, short-circuited by the electrical bolt. Immobilized, R2-D2 is deactivated and deposited at a tank-sized vehicle called a sandcrawler, a gigantic rolling factory. A restraining bolt is attached to his outer shell to keep him from escaping. An enormous suction device swallows him up, magnetically lifts him up and dumps him in the holding area in the interior of the sandcrawler. There, as he recovers from the paralyzing effects of the beam, he is reunited with C-3PO in the large junkpile. Stormtroopers quickly track the lifepod and find tracks going off in different directions. They discover a fragment of metal plating in the sand: "Look sir, droids." Owen: Can you speak Bocce? Having heard enough, Owen shouts: "All right, shut up!" and he agrees to buy C-3PO. A whining R2-D2 is abandoned when Uncle Owen chooses a different, smaller red droid along with C-3PO. To R2's delight, the droid short-circuits as it is led away, a faulty unit with a "bad motivator." C-3PO recommends the "prime condition" of the blue R2 unit, a "real bargain." And so, the two droids are bought together. Humorously, C-3PO tells his pal: "Now, don't you forget this! Why I should stick my neck out for you is quite beyond my capacity." In his uncle's garage, Luke cleans up his two new droids by giving them a decontamination bath, although he dreams and longs to be in other distant worlds: "It just isn't fair...I'm never gonna get out of here!" C-3PO asks if he may offer assistance to his new owner. Luke replies: "Not unless you can alter time, speed up the harvest, or teleport me off this rock!" The young boy describes how far they are from the center of everything: "Well, if there's a bright center to the universe, you're on the planet that it's farthest from." While cleaning R2-D2, Luke notices the droid's carbon scoring: "It looks like you boys have seen a lot of action." C-3PO agrees: "With all we've been through, sometimes I'm amazed we're in as good condition as we are, what with the Rebellion and all." R2-D2 bleeps and squeaks, trying to mislead Luke into thinking the image is nothing but a malfunction and a display of old data. Luke wonders about the miniature lady and her message: "Who is she? She's beautiful." C-3PO translates the beeps and blips of R2-D2 for Luke when the droids decide that they can trust their new master: "He says that he's the property of Obi-Wan Kenobi, a resident of these parts. And it's a private message for him." Luke has actually heard of a strange hermit with a similar name, Old Ben Kenobi who lives out beyond the Dune Sea. Luke considers listening to the entire message: "It sounds like she's in trouble. I'd better play back the whole thing." But the message cannot be played in its entirety, as C-3PO interprets: "...the restraining bolt has short-circuited his recording system. He suggests that if you remove the bolt, he might be able to play back the entire recording." Deciding that the droid is too small to run away, the restraining bolt placed on R2-D2 by the Jawas is removed. Instantly, the message and the lady disappear. R2-D2 stubbornly refuses to play it again - the message will only be played for Obi-Wan Kenobi. Luke is interrupted, called to dinner by his aunt. C-3PO scolds his companion: "Just you reconsider playing that message for him." During the dinner conversation, Luke tells his uncle: "I think that R2 unit we bought might have been stolen...I stumbled across a recording while I was cleaning it. He says he belongs to someone called Obi-Wan Kenobi. I thought he might have meant Old Ben." Both of Luke's relatives turn silent. Luke's uncle, believing "that wizard's just a crazy old man," instructs Luke to erase the memory of the robot the next day because the droid now belongs to them. Luke worries that Obi-Wan may come looking for his robot, but his father answers: "He won't. I don't think he exists anymore. He died about the same time as your father." [Luke is an orphan, cared for by his aunt and uncle.] Luke excitedly asks: "He knew my father?" Owen refuses to answer and wishes the subject dropped: "I told you to forget it." Luke wisely changes the subject, mentioning his intention to transmit his application to the Academy in the present year if the droids work out satisfactorily. Owen objects, wishing him to apply the next year after another harvest season: "Harvest is when I need you the most. It's only one season more." After Luke stalks out frustrated, his Aunt Beru (Shelagh Fraser) shows some understanding of the boy: "Luke's just not a farmer, Owen. He has too much of his father in him." Owen agrees: "That's what I'm afraid of." Outside, white-robed Luke stands on a small rise, watching Tatooine's twin suns setting near the horizon. [Tatooine has a binary star system - therefore, he can watch two sunsets every night.] He believes he may never fulfill his dream of piloting a starship to distant worlds, never escaping from the dry arid desert of Tatooine. Returning to the robots in the garage, Luke finds C-3PO hiding and scared: "It wasn't my fault, sir! Please don't de-activate me!" According to C-3PO, R2-D2 is "faulty, malfunctioning. He kept babbling on about his mission" and then wandered off into the desert night. Luke scans the horizon with a pair of electro-binoculars equipped with night-vision, but R2-D2 is nowhere to be seen. Luke decides they must wait until morning to search for him: "It's too dangerous with all the Sand People around...That little droid's gonna cause me a lot of trouble." C-3PO concurs: "Oh, he excels at that, sir." The next morning, without telling his uncle, Luke and C-3PO give chase into the desert after runaway R2-D2 in a jet-propelled landspeeder, a vehicle which skims a foot off the ground. They are watched from high on a ridge by two dangerous, nomadic warriors called Tusken Raiders (Sand People), riding on shaggy, elephant-like creatures. The landspeeder quickly catches up to R2-D2, who immediately senses and urgently warns them that there are "several creatures approaching from the southeast." Luke guesses Sand People are attacking. He grabs his laser rifle and binoculars and runs to a nearby hill to look for them. As he scans the land, one of the Sand People rises up in front of him with a battle-axe. Luke blocks some of the blows, but is knocked to the ground as the Raider shrieks and raises his axe. Luke faints and is dragged down to the landspeeder where a group of Sand People plan to ransack his vehicle. R2-D2 hides in a small crevice in the rocks. Ben: Obi-Wan Kenobi. Obi-Wan. Now that's a name I've not heard in a long time. A long time. Ben (smiling): Oh, he's not dead. Not yet. Ben: Well, of course I know him. He's me. I haven't gone by the name of Obi-Wan since, oh, before you were born. Luke: Well then, the droid does belong to you. Ben: I don't seem to remember ever owning a droid. Very interesting.